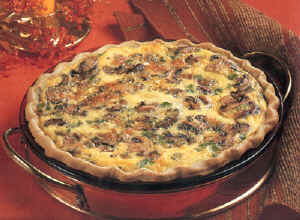 Sprinkle cheese, turkey, mushrooms, and onions into pie shell. In medium bowl beat together remaining ingredients until well blended. Pour into pie shell. Bake in oven until knife inserted near center comes out clean, 30 to 40 minutes. Let stand 5 minutes before serving. Nutritional information per serving of 1/6 recipe using 1/2 cup turkey and green onions: Calories 333, Protein 18 g, Carbohydrates 19 g, Total Fat 20 g, Cholesterol 236 mg, Sodium 521 mg.